Alive, it’s classic Deer, mixing trip-hoppy sounds with deep bass and flashes of light. I like Adriana Falcón’s timbre of voice, which sometimes reminds me a bit to the magic of Siouxsie Sioux. She brings something passionate to the production. Derrière Deer se cache les mexicains, Adriana Falcón et Miguel Bastida. Basé à Hong Kong, le duo a sorti un EP, “Portraits”, qui raconte des histoires imaginaires qui leurs sont venues en tant que résidents hongkongais. Et chaque chanson représente une pièce d’un grand puzzle, ce qu’est Hong Kong pour eux. „Alive“ ist die vierte Single aus der im März dieses Jahres erschienenen EP Portraitsdes mexikanischen, in Hongkong beheimateten Duos DEER – und wir präsentieren das dazugehörige Video von Holly James aka Animate The Earth am 22.06. exklusiv! Deer continue to promote their latest EP, Portraits, and today they are releasing a new music video for the single "Alive" that is a story about how alive one can really feel. Through the synthesizers of Miguel Bastida and the chameleon voice of Adriana Falcón - that starts with a really melancholic and also cute beginning, then suddenly it becomes really powerful. Dúo formado por Adriana Martínez y Miguel Bastida. La percusión electrónica, el sintetizador arremolinado, el piano malhumorado y la guitarra eléctrica se funden en las bellas voces de Adriana que se yuxtaponen de una entrega de coral a fracturada (en el buen sentido) ... este nuevo dúo definitivamente evoca el espíritu del trip hop. Los nuevos Portishead son dos mexicanos residentes en Hong Kong. Hong Kongis resideeruv Mehhiko bänd Deer, kes eelmisel talvel Eestitki külastas, avaldas täna oma uue singli "Alive". Algul tundus, et lugu ei jõuagi omadega kuskile, aga õnneks hakkas lõpupoole tempogi tõusma. Oleks rahulik osa lühem ja küttem osa pikem, oleks veel etem. Opener Wild Eyes addresses immigration as singer Adriana Martinez theatrically delivers, “Sit down, wake up, shut up, turn around”. Instrumentally, it’s full of resonating synths, Nine Inch Nails industrial kits, and a low, dirgy guitar riff, as if Crystal Castles had joined forces with Royal Blood – it’s a bold start. Wild Eyes This is just great. Kicking off with Killer-esque guitars, it lulls listeners into a false sense of security, before launching into a massive and compelling chorus that insists you get on your feet and throw yourself around with wild abandon (which was a bit embarrassing as I was on the MTR at the time). Its huge and hypnotic outro will change your life (not necessarily for the better, but your choice – you could have gone to church instead, right?). Deer es la única banda alternativa con origen mexicano en la escena independiente de Hong Kong y la primera (música original) en empezar su carrera en dicha ciudad. Su música es una mezcla de trip hop, sonidos industriales, bajos profundos y el plus de la poderosa voz de Adriana. Deer går även under namnet Deer under Dollars & Cents. Bandet är en mexikansk duo som är baserad i Hong Kong och består av Adriana Falcón (sång/gitarr) och Miguel Bastida (Synth/gitarr). Nu släpper duon sin nya EP “Portraits”. Un duo messicano residente a Hong Kong che fa trip rock. Le premesse geografiche ci sono tutte per compiere viaggi musicali, e così è per i Deer, che nel loro Ep "Portraits" ci propongono 4 canzoni dense di suggestioni timbriche crepuscolari. Prima di pensare ai Massive Attack, il riferimento noto che viene alla mente è quello dei primi Portishead, però la voce femminile qui è molto meno sofferta, anzi in certi momenti appare sicura di sé e più "nera". Así queda claro en su flamante Portraits, un EP en el que el dúo mexicano residente en Hong Kong desarrolla un sonido absolutamente singular, con tanto de introspección como de experiencia combativa. Vandaag komt hun ep ‘Portraits’ uit en daaruit werd Wild Eyes als singel gelicht. De song kreeg een clip van Jorge ‘The Hong Kong Fixer’ Moya. 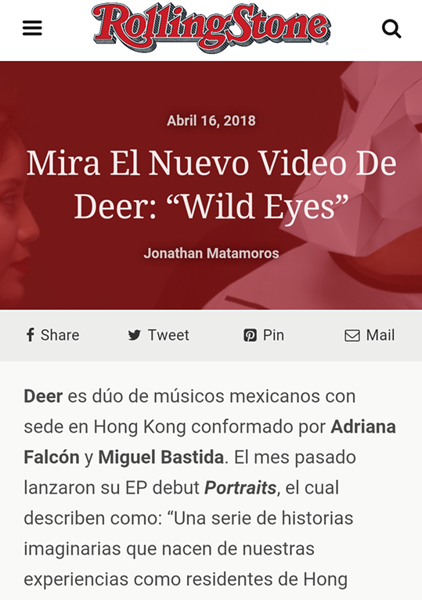 Deer, a mexican duo formed by Adriana Falcón (voice, guitar) and Miguel Bastida (keyboards, synths and guitar) and currently based in Hong Kong, are releasing a new EP today called Portraits and are also presenting it through a new music video for the single "Wild Eyes". Deer (MX) are releasing a new Ep titled Portraits. The Ep will be available on Spotify, iTunes, Deezer, Soundcloud and Bandcamp on March 9, 2018. 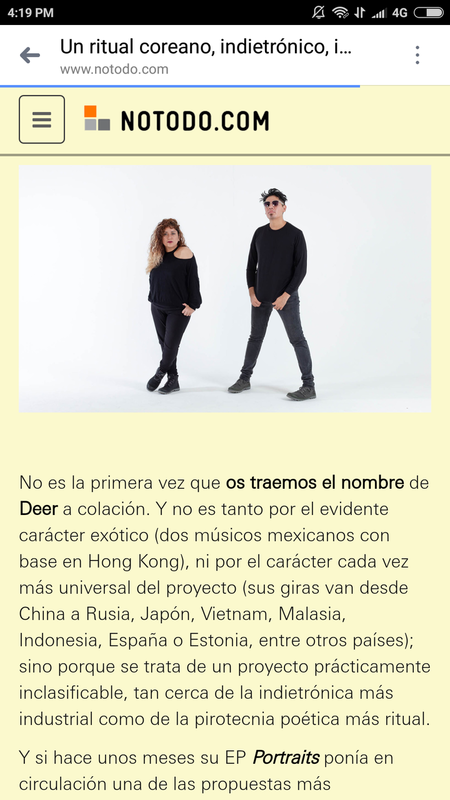 Deer is a Mexican duo based in Hong Kong; conformed by two musicians Adriana Falcón (Singer, Guitar) and Miguel Bastida (Key, Synths and Guitar). Mixing trip rock, industrial sounds and deep basses plus Adriana's powerful voice and the nostalgia in their lyrics. Avec Portraits, EP fort de quatre titres...forts, il en propose une déclinaison fiable et attractive. Wild eyes, à la fois brut et finaud, porté autant par la voix d'Adriana Falcon que par les décors de son acolyte Miguel Bastida, inaugure brillamment l'EP. L'univers de Deer est autant trippant que puissant. Deer (MX) è l’amalgama sonora di due musicisti messicani, Adriana Martinez e Miguel Bastida, che però vivono dall’altra parte del pianeta, Hong Kong, e a Marzo del prossimo anno pubblicheranno il nuovo Ep intitolato Portraits. Deer is a Mexican band based in Hong Kong. Mixing trip rock, industrial sounds and deep basses plus the powerful vocals and the nostalgic in their lyrics. 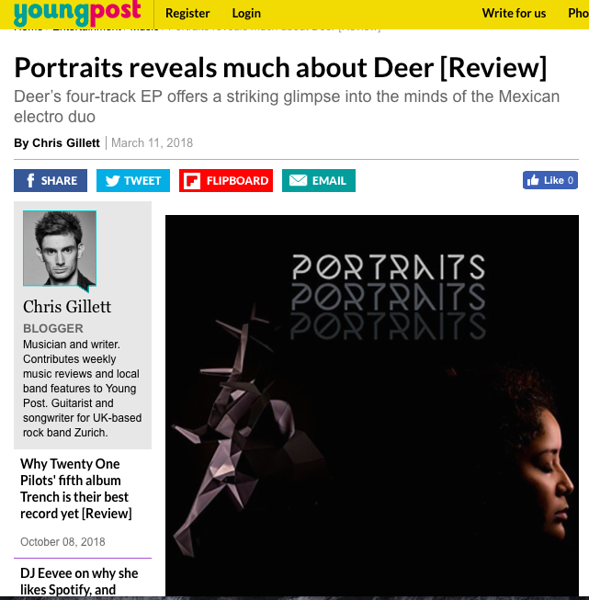 Deer have toured their hypnotic music across China, Japan, Taiwan, Korea, Malaysia, Vietnam, Russia, Estonia and Spain and performing in some of the best music festivals around Asia. Mexican duo Deer are currently based in Hong Kong, so it makes sense that their new video for ‘In The Shadows’ is also set there. Moody blue filters and a variety of disorientating effects help create a distorted, engrossing vision of the region as the video’s somewhat menacing protagonist stalks its streets, subways and markets, before the band provide him with a new direction (and a snazzy mask). In The Shadows is a great example of what Deer do, as deep, moody beats underpin the vocals from Adriana Martinez Falcon. Meanwhile, the video, directed by Jorge ‘The Hong Kong Fixer’ Moya similarly juxtaposes stillness with the chaos and hubbub of one of the world’s busiest and most crowded cities, a city of opposites and, 20 years on since rejoining China, ongoing turmoil as to it’s place in the world. Deer’s latest single ‘I Want It All’ begins with a low tremolo synth fading in, panning from side to side, whilst a distant electronic dubstep drum pattern resonates in. It all explodes with a punchy kick, slapping snare, and intricate high-end programming prominent in Bjork’s ‘Homogenic’ era. Mehhiko juurtega Hong Kongi kollektiiv Deer Mx. 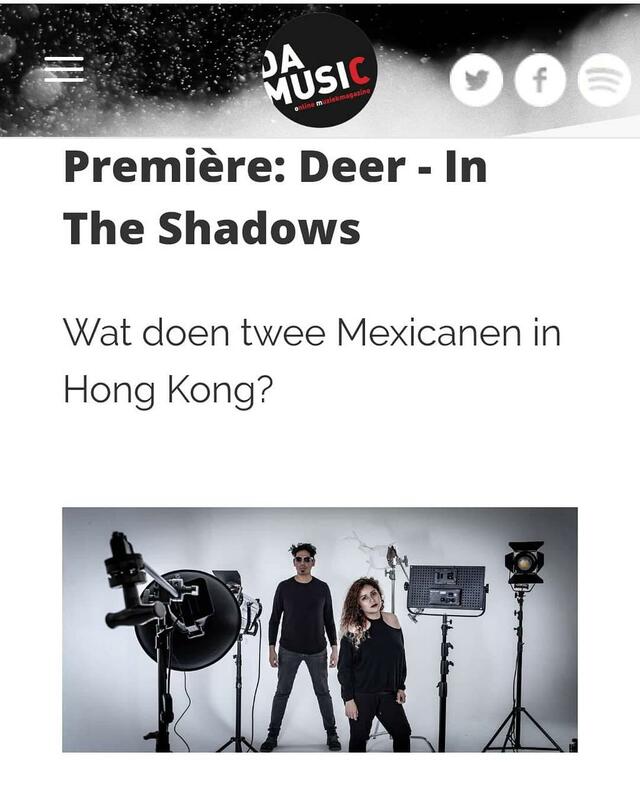 Deer MX on Hong Kongis tegutsev duo, mis koosneb Mehhiko juurtega Adriana Falconist ja Miguel Bastidast. Duo toob talvisesse Tallinnasse Lõuna-Ameerika vibe'iga triphoppi ja sügavaid bassilaineid.